Medical Physicists will contribute to maintaining and improving the quality, safety and cost-effectiveness of healthcare services through patient-oriented activities requiring expert action, involvement or advice regarding the specification, selection, acceptance testing, commissioning, quality assurance/control and optimised clinical use of medical devices and regarding patient risks and protection from associated physical agents (e.g. x-rays, electromagnetic fields, laser light, radionuclides) including the prevention of unintended or accidental exposures; all activities will be based on current best evidence or own scientific research when the available evidence is not sufficient. Medical physics is also called biomedical physics, medical biophysics or applied physics in medicine is, generally speaking, the application of physics concepts, theories and methods to medicine or healthcare. Medical physics departments may be found in hospitals or universities. Medical physics has a much wider scope and may include research in any applications of physics to medicine from the study of biomolecular structure to microscopy and nanomedicine. Insights in Medical Physics is an open access scientifc journal which publishes peer reviewed articles in the area of medical physics. 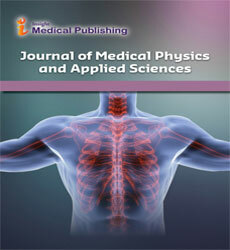 The journal publish articles with theoretical and experimental contributions for publication covering all dimensions of medical physics such as application of radiation physics with relation to radiation therapies, nuclear medicine related physics applications, medical imaging, signal processing and signal output analysis for medical devices, application of physics in biomedical devise development, computer aided image analysis etc. Articles are welcome in the mentioned discipline along with other associated areas of the subject. The Journal is using Editor Manager System for easy online tracking and managing of the manuscript processing. Biomedical physics is the conjugation of Physics and Biology in Medicine. It is an interdisciplinary field of science that involves the application of subspecialties of Biology, Chemistry, Physics, Mathematics and Computer Sciences for the growth and development of medical science and healthcare. Computed tomography (CT) is a scientific procedure that uses the application of special X-ray equipment to visualize and analyze detailed pictures or scans of areas inside the body. It is also known as Computerized Axial Tomography (CAT). The picture created during a CT imaging procedure shows the organs, bones, and tissues of the body. Radiology is a medical procedure that uses imaging to analyze, diagnose and treat diseases seen within the body.Diagnostic and Interventional Radiology Physics mainly concentrate on digital imaging technologies like Computed tomography, X-ray imaging, magnetic resonance imaging . Fluoroscopy is a medical imaging technology that shows a continuous X-ray image on a monitor of an analyzer. Fluoroscopy procedure involoves the passage of an X-ray beam through the body. Fluoroscopy uses x-ray to produce real-time video images. Health care refers to the analysis, diagnosis, treatment, and prevention of disease, disorders, illness, injury, and other physical and mental trauma in human beings. Health physics is also known as The Physics of Radiation Protection. It is the science that encompasses the recognition, evaluation, control of health hazards and permits the safe use of ionizing radiation. The Health Physics keeps an objective to protect humans from the adverse and fatal health effects associated with exposure to ionizing and non-ionizing radiation. Mammography is the scientific process of using low-energy X-ray, i.e., around 30 kVp, to examine the human breast. It is the method which is used as a diagnostic and screening tool. Mammography works on the objective of the early detection of breast cancer. Medical Physics is the branch of physics that involves the application of physics to the needs of medicine. Medical physics is the basis for the technical foundations of radiology, radiation oncology, and nuclear medicine. Nuclear medicine is a medical imaging procedure that applies radioactive material to diagnose and determine the extremity of diseases. Nuclear Medicine Physics follows the principle of the physics that offers theoretical foundation and applications of nuclear medicine. Radiation oncology is the medical procedure for the treatment of cancer using ionizing and non-ionizing radiation. This process is also known as Radiotherapy. It is a cost effective technique used for symptom control, such as pain management. Radiation protection often known as radiological protection. It is the scientific practice of protecting living beings and the environment from the harmful effects of ionizing and non-ionizing radiation. Regulations and standards are developed by the authority to decide that limit of radiation to which a person and biotic system can be exposed in a particular situation. Radiation Safety is a scientific practice to introduce all faculty, staff and students to the safe handling of radioactive materials. It is made mandatory by the authority to follow it while work with radioactive materials. Therapeutic Physics is the branch of physics that encompasses the principles and application of physics for the treatment of disease and the action of remedial agents. X-radiation or X-rays is an electromagnetic radiation that lies in the wavelength range 0.01 to 10 nanometers, frequencies in the range 3×1016 Hz to 3×1019 Hz and energies in the range 100 eV to 100 keV. X-ray can penetrate the living body, thus, it is commonly used in imaging techniques to create pictures of the inside of your body. The images show the parts of your body in different shades of black and white.